They aren't rats or mice, but are a species of their own. 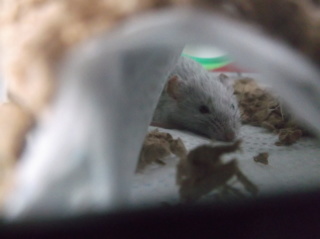 People call them both Natal multimammate mice and African soft furred rats, but truth is they aren't a mouse or a rat. You can house a female ASF with a male mouse, I'm sure it's possible to house multiple females with a male as well, but don't quote me on that. The reason it's okay is because a male mouse would live with a group of females in the wild, so as long as the ASF(s) are all female they can live with a male mouse. In the wild though, male mice would chase off, fight, or kill other male mice, and I would assume there is the possibility they could do the same with male ASFs, which is why you want to house a male mouse with female ASFs. And because they are different species, they cannot breed. Fancy mice do treat ASFs like their own kind! They sleep together, groom each other, etc., just like they would do when housed with their own kind. ASFs are also known as multimammate mice. They are sort of a hybrid. Although they are a different species, they coexist with fancy mice peacefully. Males benefit greatly from the companionship of female ASFs and the female ASFs are social, so they also enjoy the company. Care is the same but they are a little larger, so they need more space and a bigger wheel. They should at least be in a 20g tank. The same rules apply with intros and there is no guarantee that they will get along but in my experience, it goes well. ASFs are vet skittish though. I still can't hold mine but my boy loves her. Are their dietary needs the same? I personally still don't know what to think about them, like whether they're rats or mice. I have a female ASF rat who was with two female mice, but one died, so now she's only with one girl mouse. They REALLY like each other; they sleep together and accept each other wonderfully. I can pet mine usually without any problems and hand-feed her sometimes, and I CAN hold her, but I have to keep a hold of her tail while supporting her with my hand, otherwise she'd jump off (they have GOOD jumping abilities). And I also just feed mine the rat and mouse food I feed my normal mice. Mine isn't a biter, either, and when she takes food from my hand, she only does so very gently. They're noticeably a lot bigger than mice--their ears, eyes, size, and even their muzzles (or faces). Mine is also obsessed with the wheel; she'll sometimes eat and sleep on it, and when she's scared, instead of retreating into the igloo, she'll jump on the wheel and start spinning like crazy.